You can download the video of the lecture here. This year, Hasselt University is celebrating its 40th anniversary, centered around the theme 'Shaping the future'. Andre Geim is a Russian-born Dutch physicist. Both his parents were Russian German engineers. After earning his PhD, Geim worked as a research scientist at the Institute for Microelectronics Technology (IMT) at Russian Academy of Sciences, (1987) and from 1990 as a post-doctoral fellow at the universities of Nottingham (twice), Bath, and Copenhagen. He obtained his first tenured position in 1994, when he was appointed associate professor at Radboud University Nijmegen, where he did work on mesoscopic superconductivity. He later gained Dutch citizenship. One of his doctoral students at Nijmegen was Konstantin Novoselov, who went on to become his main research partner. In 2001 he became a professor of physics at the University of Manchester, and was appointed director of the Manchester Centre for Mesoscience and Nanotechnology in 2002, and Langworthy Professor in 2007. 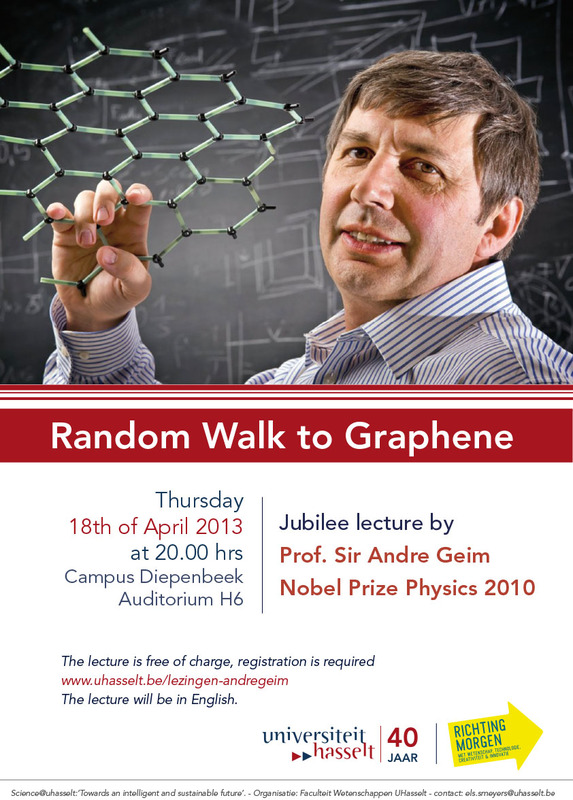 In 2010 Radboud University Nijmegen appointed him professor of innovative materials and nanoscience. Geim shared the 2000 Ig Nobel Prize in physics with Michael Berry for the frog experiment. He won several prizes and awards and was elected a Fellow of the Royal Society, a foreign associate of the US National Academy of Sciences,... He was awarded honorary doctorates from Delft University of Technology, ETH Zürich, the University of Antwerp and the University of Manchester. On October 5, 2010 Geim was awarded the 2010 Nobel Prize in Physics jointly with Novoselov 'for groundbreaking experiments regarding the two-dimensional material graphene'.Fysicus Andre Geim is één van de beroemdste wetenschappers op het gebied van de nanotechnologie. Hij maakte plakband zonder lijm door de voeten van een gekko te imiteren en was één van de pioniers in het onderzoek van het tweedimensionale materiaal: grafeen. Hij staat bekend als een man met humor; hij won de IgNobelprijs door een kikker in een magneet te laten zweven en voerde zijn hamster op als coauteur van het artikel dat dit verschijnsel beschreef.